Portland’s world’s fair, the 1905 Lewis & Clark Centennial Exposition and Oriental Trade Fair, was a landmark event in the city’s history. It prompted many kinds of civic activity, such as this cookbook, compiled by the Ladies Aid Society of the Piedmont Presbyterian Church. Piedmont had been platted by Edward Quackenbush as a residential subdivision in 1889, located north of Rosa Parks Way and east of Martin Luther King, Jr., Boulevard. That same year a narrow-gauge railroad opened along its eastern edge, which soon became a suburban electric line that provided frequent service south to Albina and Portland and north to the Vancouver ferry along MLK. Land developers in those times sold lots; the buyers were usually responsible for building the house, and subdivisions such as Piedmont did not always build out rapidly. 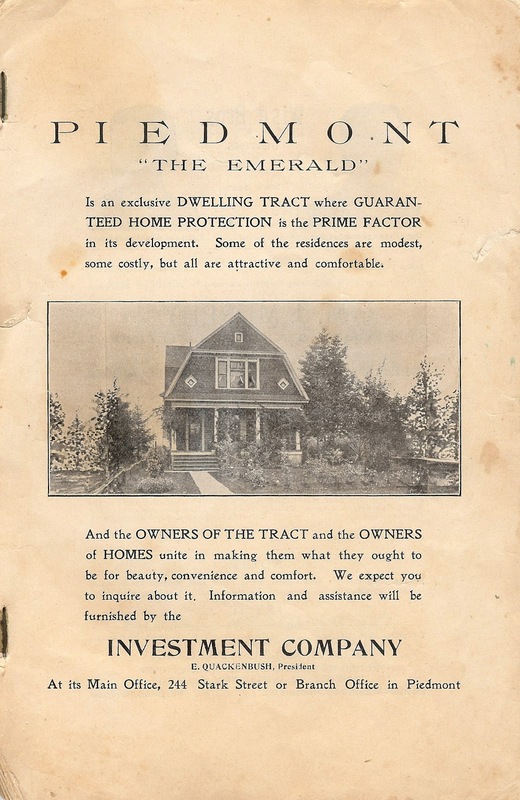 At the time the Ladies Aid Society issued their cookbook, Mr. Quackenbush still had lots for sale in Piedmont “The Emerald,” each lot covenanted with a minimum cost for the house (to prevent the building of cheap and shabby structures) and with a provision that guaranteed that no spiritous liquors would be made or sold in the neighborhood. It was a good place for a Presbyterian Church, obviously. 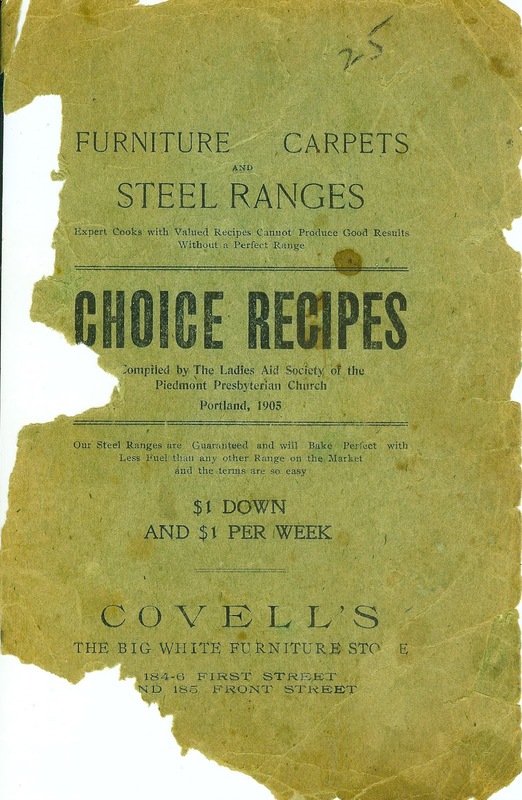 The small cookbook includes not only recipes contributed by parishioners, but also a few obtained from “well known Portland cooks.” Lilian Tingle, the head of the new Portland School of Domestic Science (look for more about her in future postings), is credited with an immensely detailed set of instructions for preparing good coffee, and with a recipe for quick cinnamon rolls (“to serve with coffee”). LEWIS AND CLARK FAIR CAKE. One cup white sugar, one-half cup of butter, one-half cup of milk, one and one-half cups of sifted Olympic flour (before), three eggs, beaten separately, three teaspoons baking powder. ICING FOR CAKE. Six tablespoons grated chocolate, one-half cup of sugar, four tablespoons of milk; put this on the stove until it dissolves, cool, pour on the cake, flavor with Woodlark’s vanilla; use boiled frosting. CHICKEN A LA PORTLAND (for three or four people). One two-pound spring chicken, skin and bone same; cut in small dice, cook with a pint and a half of cream; then Toke Point oysters, parboil; cut in two, then mix the oysters and chicken with a little green pepper. Ingredients should be thickened with a little butter and Olympic flour. Season to taste with pepper, salt and nutmeg. OYSTERS A LA PORTLAND Fresh opened Toke Point oysters in deep shell. Lay in a pan of salt and put in a little tomato catsup and a dash of Worcestershire sauce; grated cheese and cracker dust. Bake until done; serve piping hot. And in case you are wondering: Toke Point oysters were grown in northern Willapa Bay near the town of Tokeland; at this date, the reference was not to the small Olympia oysters (which were also native to Willapa Bay, but which had been harvested to near-extinction), but to introduced, farmed “Eastern” oysters. The pointed reference to Olympic flour is because that firm made a contribution to the Ladies Aid Society; so too did Woodard, Clarke & Company, bottlers of Woodlark’s vanilla.